I’m sure many of you know and have tried the combination of peanut butter, dates and chocolate. And if you haven’t, you have to try it out! It’s delicious and satisfies any sweet craving. It almost tastes like a peanut butter cup or snickers! They are SO easy and quick to make. Plus, it’s a lot healthier. Not that I would ever get tired of the delicious peanut butter-chocolate-date combination, but I wanted to see what else I could stuff these dates with. And since Easter is right around the corner and they *kind of * look like chocolate covered eggs, I thought it would be the perfect time to share what I came up with! I know a lot of people love medjool dates, but I love fresh dates sold in the refrigerated area. If you’re from Canada, Moshkan is the brand I love! Try not to overstuff the dates or they may break apart and be difficult to coat them in the chocolate. I like using chocolate with a high cacao percentage, this one from Alter Eco is my favourite! If you find your chocolate really thick, add 1-2 tsp of coconut oil to thin it out. 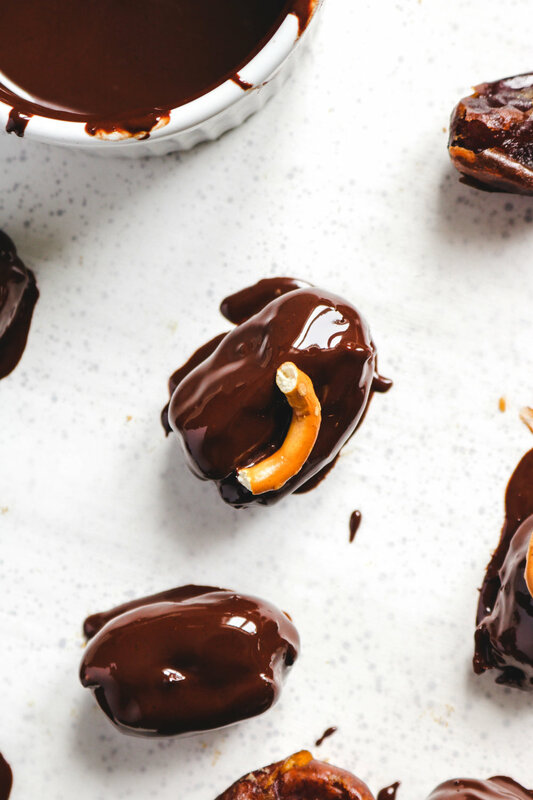 You can really stuff chocolate covered dates with anything, get creative! Use thicker seed and nut butters, they will be much easier to handle! Runny tahini will be very difficult to use here. If you recreate these Chocolate Covered Stuffed Dates 5 Ways please share it and let me know what you think by tagging me on Instagram @lisakitahara, I love seeing all of your tasty recreations! Pit your dates by slicing one side and removing the pit. Salted Tahini Stuffed Date: in a small bowl mix together the tahini and miso paste until combined. Stuff each date with 1-1.5 tsp of each mixture. For the peanut butter pretzel, place a pretzel right in the center of the date once you will it with peanut butter. Close each date and put it on a parchament lined tray. Place the tray into the fridge. Place your chocolate into a small bowl and microwave in 30 second intervals. Mix after each interval until completly melted. Dip each stuffed date into the chocolate until completly covered. I used a tooth pick for this, but you can also use a fork. Place each chocolate covered date back onto the tray and back into the fridge to let the chocolate harden for atleast 10 minutes. Store in a containerin the fridge and enjoy anytime! I used my browned coconut butter recipe but any coconut butter will be delicious. I used my homemade cookie butter here, but I LOVE stuffing it with this one too!